Lord Buddha is called the Mahapurisa in Buddhist Pali Texts! Buddhists always wonder about what Buddha meant on the Mahapurisa. 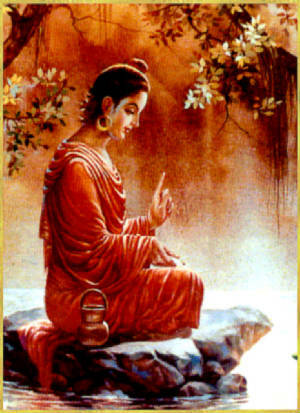 Lord Buddha is always called Mahapurusha (Mahapurisa Sutta) and has 32 signs (Lakkhana) of the Great Man. The concept of the Purusha is first found in the Rig Veda verses in the Purusha Sukta, where God becomes man (and in the Upanishads, humanity by destroying evil through meditation becomes God -- Aham Brahmasmi). Where there is no longer a difference between God and Man. Buddhaghosa says (MA.ii.761) that when the time comes for the birth of a Buddha, the Suddhávása Brahmás visit the earth in the guise of brahmins and teach men about these bodily signs as forming part of the Vedic teaching so that thereby auspicious men may recognize the Buddha. On his death this knowledge generally vanishes. He defines a Mahápurisa as one who is great owing to his panidhi, samádána, ñána and karuná. A Mahápurisa can be happy in all conditions of climate. DA.ii.794. 1 Thus have I heard. At one time the Blessed One was staying in Anatha,pindika’s Park in Jeta’s Grove near Savatthī. Who is a great man? not a great man, I say. The Following section perfectly describes Lord Buddha and his teachings: Truly Buddha Fulfills Vedic teachings and completes the understanding! identity with the Supreme Soul. The acting Soul is endued with the seven and ten possessions. 1 Thus it is said that there are innumerable kinds of Purushas in due order. In reality, however, there is but one Purusha. He is the abode of all the ordinances in respect of the universe. He is the highest object of knowledge. He is at once the knower and the object to be known. He is at once the thinker and the object of thought. He is the eater and the food that is eaten. He is the smeller and the scent that is smelled. He is at once he that touches and the object that is touched. He is the agent that sees and the object that is seen. He is the hearer and the object that is heard. He is the conceiver and the object that is conceived. He is possessed of attributes and is free from them. What has previously, O son, been named Pradhana, and is the mother of the Mahat tattwa is no other than the Effulgence of the Supreme Soul; because He it is who is eternal, without destruction and any end and ever immutable. He it is who creates the prime ordinance in respect of Dhatri himself. Learned Brahmanas call Him by the name of Aniruddha. Whatever acts, possessed of excellent merits and fraught with blessings, flow in the world from the Vedas, have been caused by Him. 2 All the deities and all the Rishis, possessed of tranquil souls, occupying their places on the altar, dedicate to him the first share of their sacrificial offerings. 3 I, that am Brahma, the primeval master of all creatures, have started into birth from Him, and thou hast taken thy birth from me. From me have flowed the universe with all its mobile and immobile creatures, and all the Vedas, O son, with their mysteries. Divided into four portions (viz., Aniruddha, Pradyumna, Sankarshana, and Vasudeva), He sports as He pleases. That illustrious and divine Lord is even such, awakened by His own knowledge. I have thus answered thee, O son, according to thy questions, and according to the way in which the matter is expounded in the Sankha system and the Yoga philosophy."